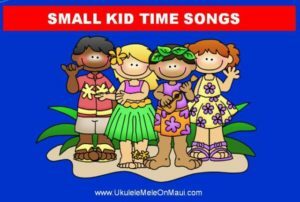 Sing-Along with Mele Fong – Small Kid Time Songs is Friday, June 15 at 10 a.m. at Kaunoa Senior Center on Maui. Why are people returning? “It’s fun!” is what participants are telling me. 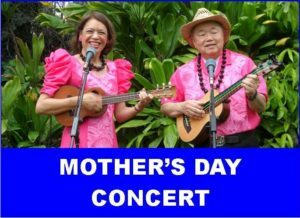 The Hawaiian Serenaders present a Mother’s Day Concert on Sunday, May 13 at 10 a.m. at Kula Hospital on Maui. My husband and I will be presenting a special Mother’s Day concert on Sunday, May 13 at 10 a.m. at Kula Hospital at 100 Keokea Place in upcountry Maui. We will a play a variety of songs including some sing-alongs. The last time we performed at Kula Hospital was in October 2010 when we brought students from my Ukulele Pops Band. We were pleased that the Activity Coordinator who helped us then remembered us now and has welcomed us back. We anticipate about 75 patients and their families to attend. This is part of our effort to give back to the community. 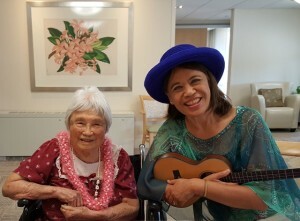 Mele Fong at her Mom’s 93rd birthday party in 2016. Mom died in 2017 before Mother’s Day and her next birthday. 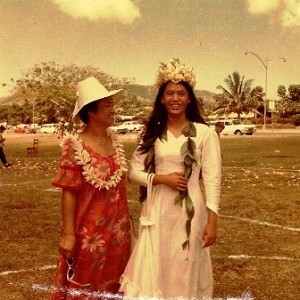 Mele Fong was crowned by teachers at Kahala Elementary School as May Day queen in 1967. Mele was selected based on academic achievements and happened to be the first queen of Native Hawaiian ancestry. This photo shows Mele and her proud mom before the royal court entered the area. Mele was 12 years-old and in the sixth grade. “May Day is Lei Day in Hawaii” is a song and a special occasion celebrated on the first of May in Hawaii Nei. The song was composed by Leonard “Red” Hawk in 1928 for the first Lei Day festival. Later in 1943, the composer adapted the words to the times and wrote “My War Lei” to emphasize the use of war stamps for leis during WWII. The first Lei Day was held on May 1, 1928 and everyone in Honolulu was encouraged to wear lei, and festivities were held downtown with hula, music, lei making demos and exhibits and contest. Originally from Oklahoma, Don Blanding is also credited with inventing the custom of tossing your lei overboard when you sailed from Honolulu. If the lei came back to shore, it meant you would return. May Day is also the time for school events. 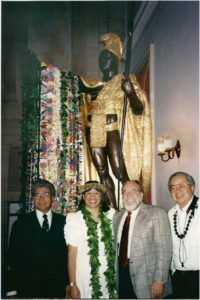 When I was in the 6th grade, I was crowned by teachers at Kahala Elementary School as May Day queen in 1967. I was selected based on academic achievements and happened to be the first queen of Native Hawaiian ancestry. Along with the king and our court of princesses representing each of the main Hawaiian Islands, we presided over the day’s activities for grades K-6. Each class performed a hula or another cultural dance for May Day. LEARN TO PLAY my arrangement of “May Day is Lei Day in Hawaii” with the Hum Ding-Ah Strum in the key of G with 5-chords for ukulele. Listen to the audio recording and then request private webcam lessons from wherever you live and I will send you the song sheets and teach you how to play it. 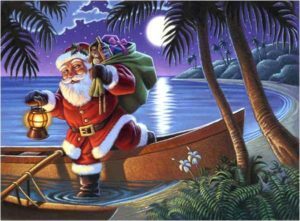 Santa in Hawaii arrives via outrigger canoe. As a child growing up in Hawaii, I remember wondering how Santa would deliver his presents because our houses don’t have chimneys. Then I saw a display of Santa in an outrigger canoe and that made sense. My favorite Christmas memory was learning how to surf on Christmas Day. When I was a kid, my two boy cousins who were three years older me, came over to our house and we walked down to Diamond Head beach with our boards. I remember the thrill of riding the waves and the speed and power of the waves pushing you forward. It was all about balance – learn too far forward and you’d pearl dive nose first into the water – learn too far back and the wave would pass you by. Looking back at that experience, learning to surf was about life – about the balance of taking chances to keep going forward. When I attended college on the mainland, I would come home during Christmas and help my dad entertain at Shriners Hospital for Crippled Children. My dad sang and played his ukulele as a member of the Aloha Temple musicians during the Christmas Day breakfast program. I joined in singing and playing my guitar to Christmas classics. It was a memorable tradition that we maintained for several years. My husband and I married 23 years ago and we have spent the past 23 consecutive Christmases on Oahu visiting both our families and friends. My husband and I married 23 years ago and we have spent the past 23 consecutive Christmases on Oahu visiting both our families and friends. Rich’s Auntie Annie always hosted a multi-generational family part on Christmas night. We were surprised this year to see Rich’s sister who is a nun in India. She had come home to renew her visa and then gone back to India only to be rejected entry (so she is back in Hawaii). “Do you sing on the radio?” asked one niece when she was a little girl. The little kids are all grown now. Grab bags were chosen by ages with the oldest at 104 going first and the youngest at 20 going last. It was a very subdued party. This year we attended the Service of Remembrance at Arcadia where I placed a rose to remember my mom who passed away during the year (along with others who lost loved ones). This brought closure to my routine for the past twelve years of going back and forth from Maui to Oahu to visit my parents since they are now both gone (dad died in 2012). Next year another chapter of Christmas traditions begins. 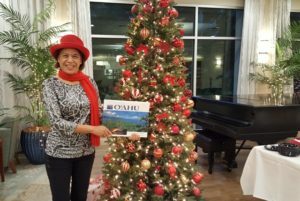 See our Christmas 2017 photo album on my facebook page and read about our 5th Annual Christmas Party on Maui. Listen to the audio recordings in the online Fan Club and I will send you the song sheet for one song and teach you how to play it with private lessons via webcam or on Maui. Purchase a downloadable Single Song Lesson for Jingle Bells. Download the Single Song Lesson for Mele Kalikimaka for free. Mele Kalikimaka Vol. 1 packaged song set of book/DVD/CD of 6 songs with 8 strums. Downloadable Single Song Lessons for Auld Lang Syne, Silent Night and We Wish You a Merry Christmas. Bonus: learn more about the story behind the song, Mele Kalikimaka – Hawai’i’s way to say Merry Christmas. As we say in Hawai’i, Mele Kalikimaka and a Happy New Year! “We go to local parties and now we have a better idea of what they’re singing,” commented recent transplants to Maui. 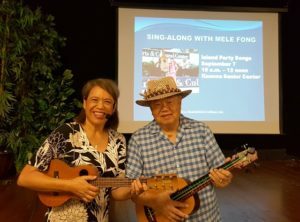 Twenty two people signed up for my monthly Sing-Along with Mele Fong Series – Island Party Songs on Thursday, September 7 at Kaunoa Senior Center for adults 55 and better. We chose the monthly theme to celebrate Aloha Festivals month, a time when each of the Hawaiian Islands celebrates the aloha spirit with festivals. The “Sing-Along with Mitch Miller” format of projecting the song lyrics and ‘ukulele chords on a screen at the front of the room, and having my husband provide the u-bass line to fill in the lower tones to the higher pitched ‘ukulele worked great! The Pidgin English Hula – I Wanna Rest / 4 And Strums. E Huli Makou – ‘Ōlapa Strum. Princess Poopooly – I Wanna Rest / 4 And Strums. Aloha No Wau I Ko Maka – 2 Waltz Strums. Keep Your Eyes on the Hands – I Wanna Rest / 4 And Strums. Yellow Bird (local style) – Latin Strum. 1. LISTEN TO THE RECORDINGS IN THE FREE ONLINE FAN CLUB and then schedule private lessons on Maui or via webcam to get the song sheets and feedback. 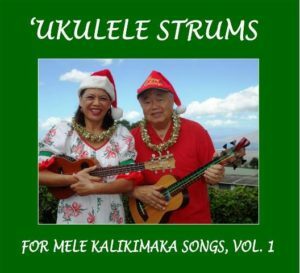 From the Hapa Haole Songs Category – Keep Your Eyes on the Hands, Manuela Boy, Medley: Maui Boy/Maui Girl, Medley: Tiny Bubbles/Pearly Shells, Princess Poopooly, The Pidgin English Hula, U.S.E.D. and Yellow Bird. From the Hawaiian Songs Category – E Huli Makou. 2. DOWNLOAD A SINGLE SONG PURCHASE to your digital device. Get the song sheets, video lesson, audio recording, and video story behind the song for the song you select. Stay tuned for the next Sing-Along with Mele Fong Series – Na Lani Eha and More on Thursday, October 5 as we celebrate the four royal composers. Visit my webpage about classes at Kaunoa and see photos from past classes for more. 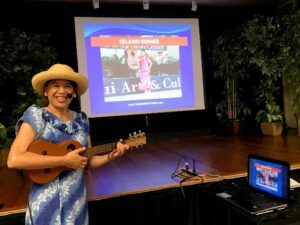 This month’s Sing-Along with Mele Fong series theme is “Island Party Songs” to be held September 7 to celebrate Aloha Festivals month on every island. 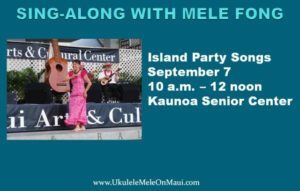 In celebration of Aloha Festivals held on every Hawaiian Island in September, join us for the next Sing-Along with Mele Fong series: Island Party Songs on Thursday, September 7 from 10 a.m. – noon at Kaunoa Senior Center for adults 55 and better. The mission of Aloha Festivals is “to foster the Aloha Spirit through the perpetuation of the Hawaiian culture and the celebration of the diverse customs and traditions of Hawaii.” Read more about Aloha Festivals. This program is one of a monthly series that evokes the feeling of sing-along with Mitch Miller programs as the lyrics and ‘ukulele chords are projected on the large screen in the front of room for everyone to follow. ‘Ukulele players are invited to bring instruments to play along as I lead everyone by singing and playing my uke while my husband accompanies us on ‘ukulele bass. Don’t worry if you don’t know the ‘ukulele chords or the unique strumming pattern for the songs. The focus is on singing the songs, finding out the stories behind them, and enjoying the group experience. Why are people returning? “It’s fun!” is what I’ve heard. Mele Fong led a Sing-Along of Island Songs on August 17 to celebrate when Hawaii became the 50th state of the union on August 21, 1959. “Being new here, we’re trying to learn Hawaiian songs. We sing Hawaii Aloha at church,” commented a caregiver who has been bringing her elderly mother to the monthly Sing-Along program. “I like the stories about the songs. You tell them with aloha,” commented another returnee to the program. 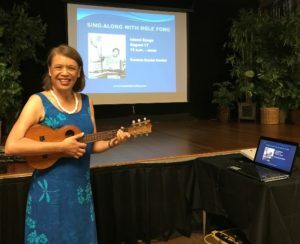 Twenty people signed up for my monthly Sing-Along with Mele Fong Series – Island Songs on Thursday, August 17 at Kaunoa Senior Center for adults 55 and better. We chose the monthly theme to celebrate Hawaii’s Statehood Day on August 21, 1959. Learn more about statehood. Island Medley (5 islands) – Hum Ding-Ah / I Wanna Rest Strums. King Kamehameha the Conqueror of the Islands – I Wanna Rest Strum. Maui – Ulupalakua – ‘Ōlapa Strum. Maui – Maui Waltz – 2 Waltz Strums. Maui – Lahaina – Latin Strum. Maui – Puamana – I Wanna Rest Strum. Oahu – On the Beach at Waikiki – Hum Ding-Ah Strum. Big Island – My Little Grass Shack – I Wanna Rest Strum. Kauai – Hanalei Moon – I Wanna Rest Strum. LISTEN TO THE RECORDINGS IN THE FREE ONLINE FAN CLUB and then schedule private lessons on Maui or via webcam to get the song sheets and feedback. From the Hapa Haole Songs Category – Hanalei Moon, King Kamehameha, Maui Waltz, My Little Grass Shack, and On The Beach at Waikiki. From the Hawaiian Songs Category – Island Medley, Puamana, and Ulupalakua. PURCHASE A PACKAGED SET OF BOOK/DVD/CD to learn the songs off-line. From Nostalgic Hawaiian Songs Vol. 1 – On the Beach at Waikiki (and 5 other songs). From Nostalgic Hawaiian Songs Vol. 2 – Hawaii Aloha (and 5 other songs). DOWNLOAD A SINGLE SONG PURCHASE to your digital device. Get the song sheets, video lesson, audio recording, and video story behind the song for the song you select. Stay tuned for the next Sing-Along with Mele Fong Series – Hawaiian Party Songs on Thursday, September 7 as we celebrate Aloha Festivals month.